It was a familiar road, but the adventures it would lead us to were unknown. My friends Nick and Christian and I were driving northbound out of Seattle on I-5, a route I take often on my way to the mountains. Today, we were ready to kick off a two-day road trip through Skagit Valley — from hiking in the North Cascades to paddling near the Salish Sea, and everything in between. 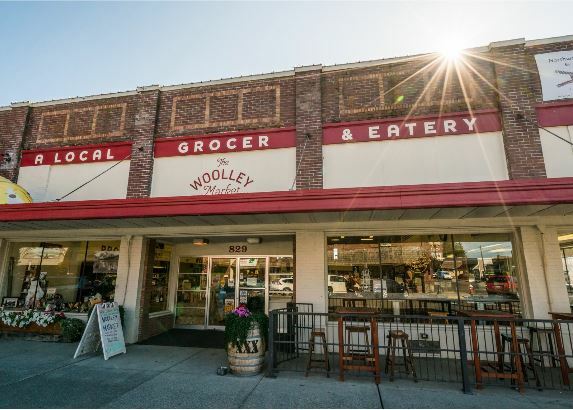 On our way to the mountains, we drove through Sedro-Woolley and decided to stop at the Woolley Market, a local grocery store and eatery in the downtown area, to fuel up before our hiking adventures. The Woolley Market entrance in downtown Sedro-Woolley. I walked down the aisles of the market, searching for and finding several perfect snacks for our road trip adventure. We also walked up the deli and ordered two sandwiches each — one to enjoy on the spot, and another to enjoy on a hike later that day. We were prepped and ready for the trail. After the Woolley Market, we continued east along Highway 20 — the famous North Cascades Highway — to the Marblemount area, near the entrance to the North Cascades. En route to Cascade Pass trailhead. Pulling into Marblemount, we turned off onto the Cascade River Road, which led us to the Cascade Pass trailhead, the start of our first hike. We stepped out and gazed up at the many towering mountains overhead, including Johannesburg Mountain, a sight that always puts me in awe. We laced up our hiking boots and picked up our backpacks, starting the several mile hike to Cascade Pass, and then eventually to Sahale Arm. Hiking along Sahale Arm, surrounded by countless Cascade peaks. Hiking along Sahale Arm, the views of countless Cascade peaks improved upon each step. Clouds swept into the area, creating a dramatic scene that kept our heads on a swivel. After reaching the Sahale Glacier Camp at the top of the Arm, our turnaround point, we rested and enjoyed our deli sandwiches from Woolley Market. The afternoon quickly passed, and we decided to start the hike out, enjoying the sunset on the way back down to the car. After reaching the trailhead again, we jumped in our vehicle and headed toward the Marblemount area to car camp for the night. Waking up early at our car camp, we were determined to catch sunrise from high up in the mountains. We reached the Sauk Mountain trailhead and started the short hike up to the summit of the mountain. We hiked up the many switchbacks and reached the summit. At the top, we were in a thick cloud, which at first obscured views in all directions. We sat down and waited it out. Our patience paid off — eventually, the clouds parted and we found ourselves above a low cloud layer. In the distance, many North Cascades peaks, including the remote Picket Range, appeared above the cloud layer, creating a magical scene. Views of the remote Picket Range, a subrange of the North Cascades. After soaking up all the beautiful sunrise views from the summit of Sauk Mountain, we decided to call it a morning. We turned around and hiked back down to our vehicle once again. After our morning hike, we drove to the Concrete area for a quick breakfast, and then continued westward on Highway 20 toward the Salish Sea. Driving past beautiful forests and farmland, we eventually reached the Burlington and Mount Vernon areas. We turned off the highway, and headed toward the quaint town of La Conner. We pulled into La Conner and drove to the local kayak shop along the Swinomish Channel. We were greeted by the shop owner and his friendly dog, Redford. Redford the dog, greeting walk-up visitors at the La Connor kayak shop. We rented three kayaks and paddled along the channel. The emerald green water swirled as we floated past other boats coming in and out of Skagit Bay and the Swinomish Channel. Paddling along the Swinomish Channel, in the La Conner area. After our paddle, we said farewell to the kayak shop owner and Redford the dog, and we drove a few blocks into La Conner’s town center. After our hiking and paddling adventures, a good bite to eat was in order. We stepped into La Conner Brewing, and took three spots at the bar. 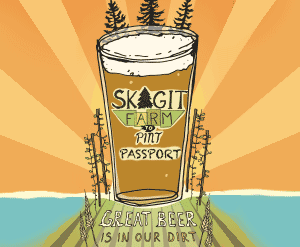 On the Skagit Farm to Pint Ale Trail. We ordered a flight of local beers — earning a stamp in my “Farm to Pint Ale Trail” passport. We enjoyed a few appetizers and exchanged laughs and thoughts about the fun adventures of the last two days. With our appetites fully satisfied, we stepped out of La Conner Brewing and jumped back in the car. I drove us back to Seattle, thankful to have such a magical area so close to home. Another successful Skagit Valley road trip was in the books. Story and images by Scott Kranz. Scott Kranz (@scott_kranz) is a full-time photographer based in Seattle, Washington, specializing in outdoor sports, lifestyle, landscapes, and travel photography and storytelling. Partnering with the world’s leading outdoor brands, Scott’s professional work includes hiking and alpine climbing in the Cascade, Sierra, and Rocky mountain ranges; trekking in both the European and New Zealand Alps; canyoneering and mountain bike expeditions in the Southwest desert; and backcountry skiing among the active volcanoes of Japan.